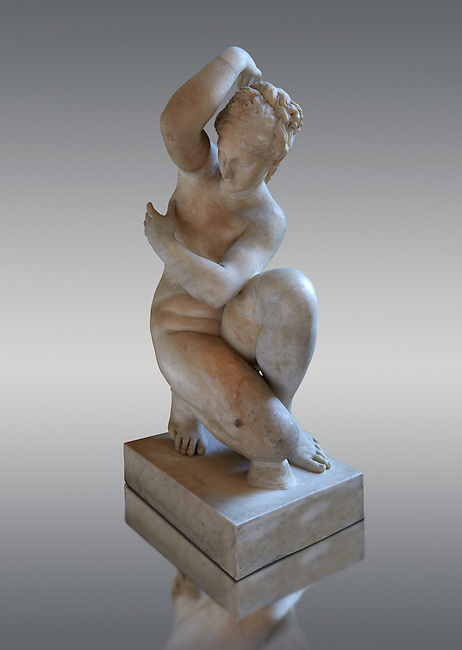 This sculpture is a variation on the Classic Hellanistic 3rd to Ist century BC style of Aphrodite crouching to bathe. Aphrodite crouches with her right knee close to the ground, turns her head to the right and, in most versions, reaches her right arm over to her left shoulder to cover her breasts. The sculpture here changes the pattern by raising the right arm to the neck, rather than making her arm cross her chest, this flattens the composition.